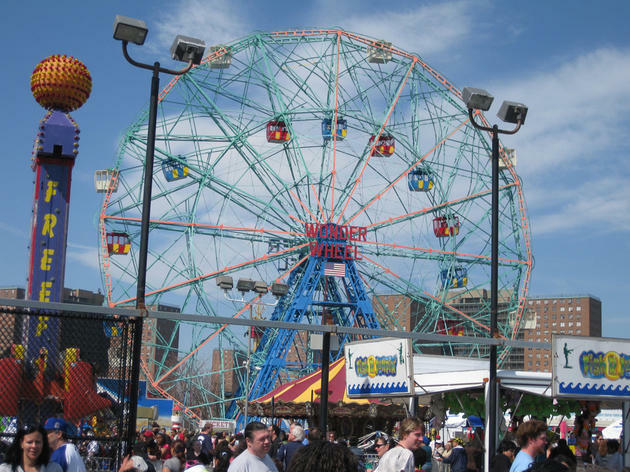 Deno's Wonder Wheel Amusement Park is a Coney Island attraction. The eponymous wheel was built in 1920. Deno's amusement park!! OMG. 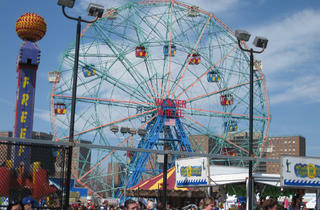 SO coney island is like the only cool amusement park with loads of rides within nyc (or so I think). Deno's is the bomb! I've been coming here since I was a kid, and it's nice to see a bunch of rides stick around this long. I do miss a few though like the tilt a whirl (idk if that's what it was called) and they had something called bumper boats at one point that was the best ride ever! It's basically bumper cars but you're on a boat in water and you can drive and spray people with water it was the bomb. Sigh. The good old days. The Wonder Wheel and Cyclone are still there so that's great. I've kinda gotten over the whole swinging ferris wheel bit over the years, but the Cyclone always gives that nice adrenaline rush. There's games with prizes to win, but I tend to stay away as they are almost always rigged (except the water shooter where you shoot water from a gun, I am ACE at those- no really, I've won like every single time I've played). Especially those side games ones. Ugh. Got duped like $120 once and vowed to never play a game again. The arcade has lots of game options too. All in all a kickass place (the first couple of times lol).